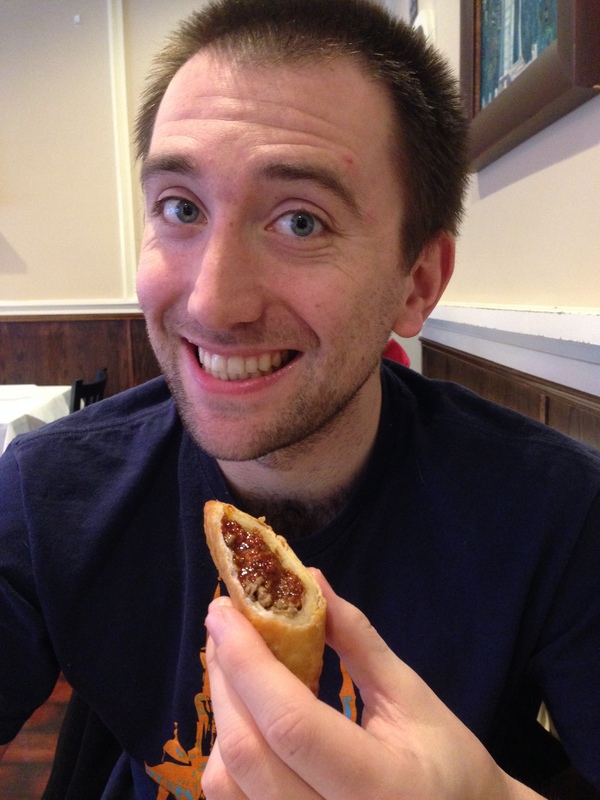 Hello and sorry everyone for the lull on Mastication Monologues, but I’m back with a fresh new post that is part of Restaurant Week that is now over in Chicago. 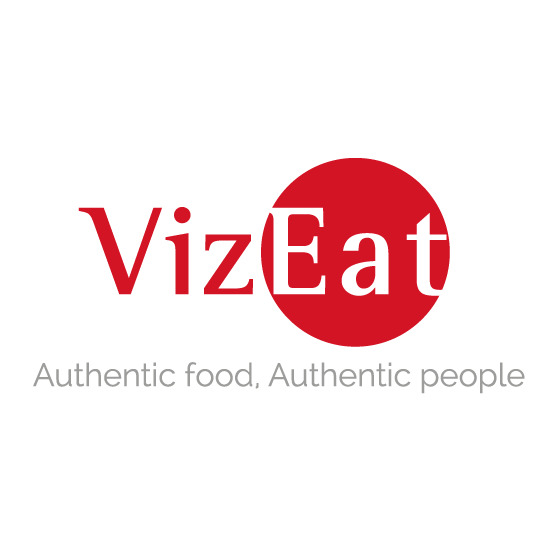 For those of you who don’t know, Restaurant Week in Chicago is a multiple week event where a multitude of eateries throughout Chicago open their doors to everyone with great deals. 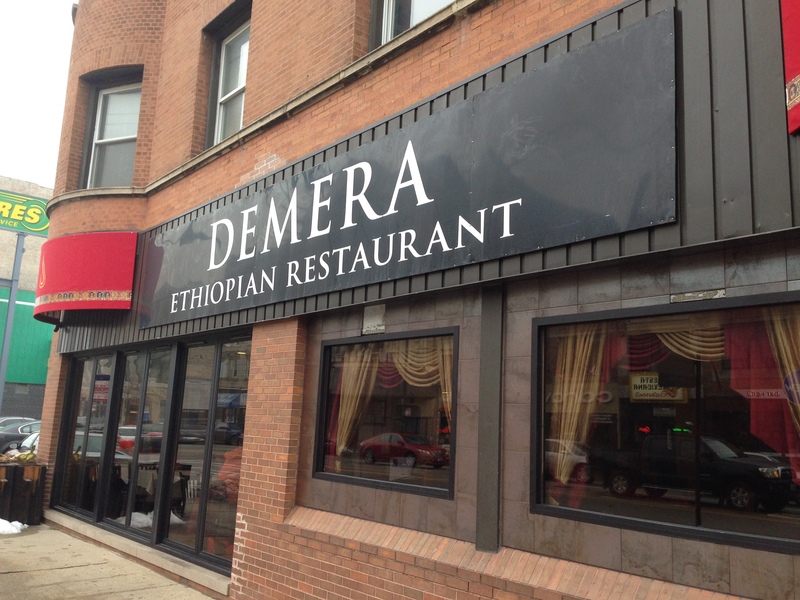 In this post, I’d like to tell you a little bit about Demera, one of Chicago’s premier Ethiopian/Eritrean diner. Janice and I went there for their lunch special, and the inside was brightly lit and bumping with some funky Ethiopian jamz. 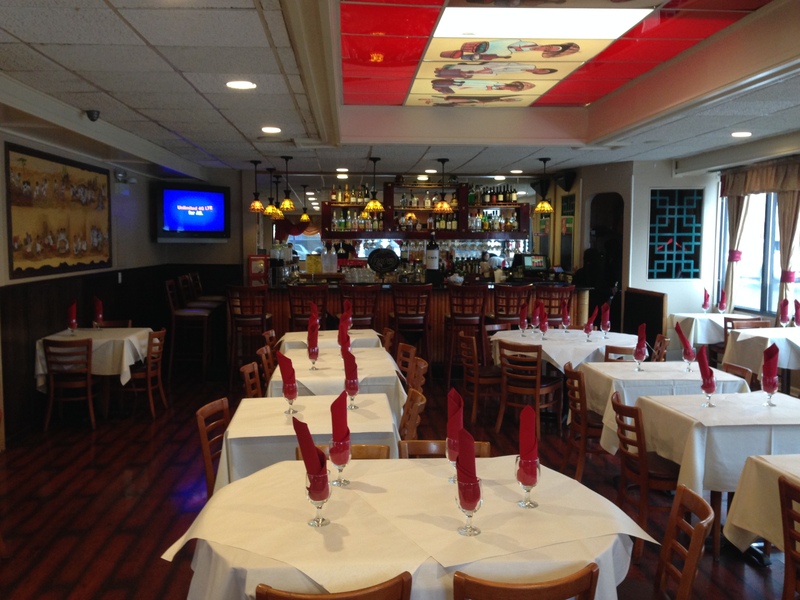 We were quickly seated, and we had some trepidation with what to pick since everything sounded so delicious. 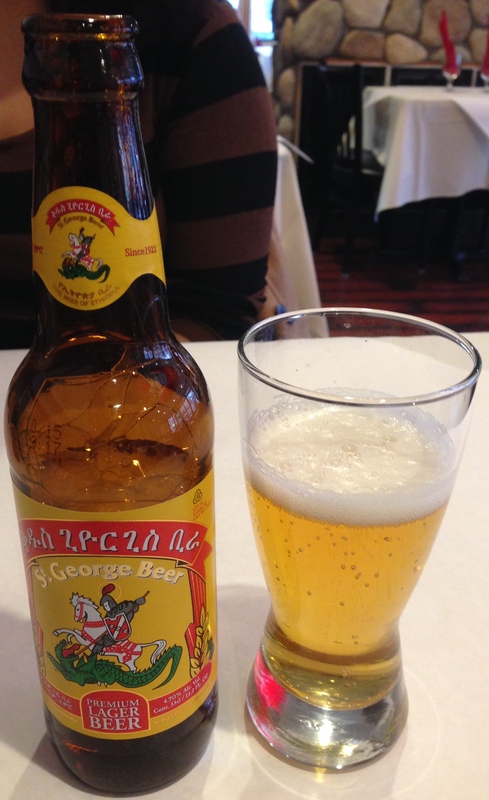 I started the meal off with a St. George Beer to drink. Ethiopia is interesting enough since it is a mainly Christian society surrounded by Muslim nations, and some go on to even speculate that the Ethiopian people are descendants of one of the 12 lost tribes of Israel. 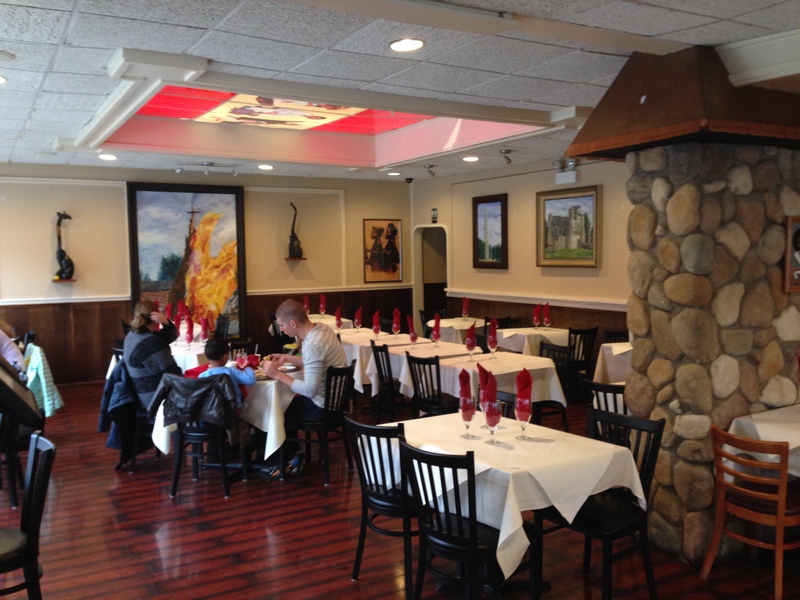 The name of the place, Demera, is the term in Amharic for the ceremonial bonfire used in the Ethiopian Christian version of Ash Wednesday, and we had a similar religious experience with the food. 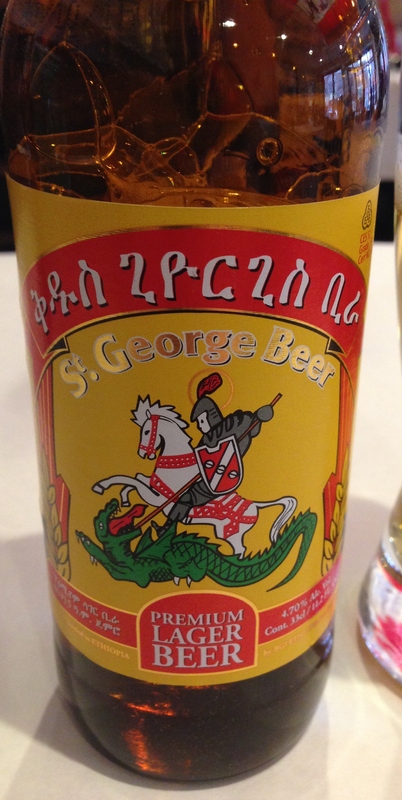 However, the St. George Beer wasn’t very noteworthy since its neutral flavor and watery consistency left me hoping for the second coming of my food savior to resurrect my taste buds from the bland rapture. Luckily, the beef sambussas and timatim selata did just that. 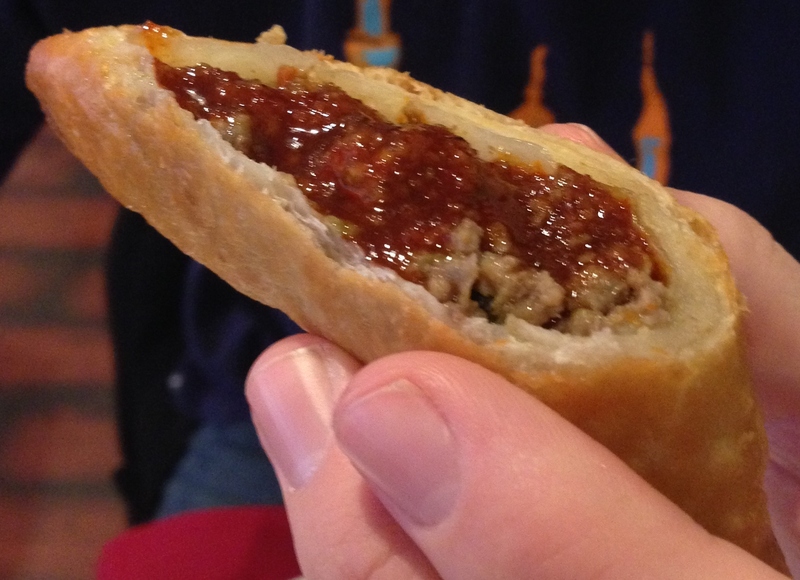 First, there were the beef sambussas that I could liken to a lighter version of empanadas. The dough was less pie-like and more flaky and light like Greek philo dough. The meat was spiced and amped up in terms of flavor with the spicy yet sweet yet dangerously addicting awaze sauce. 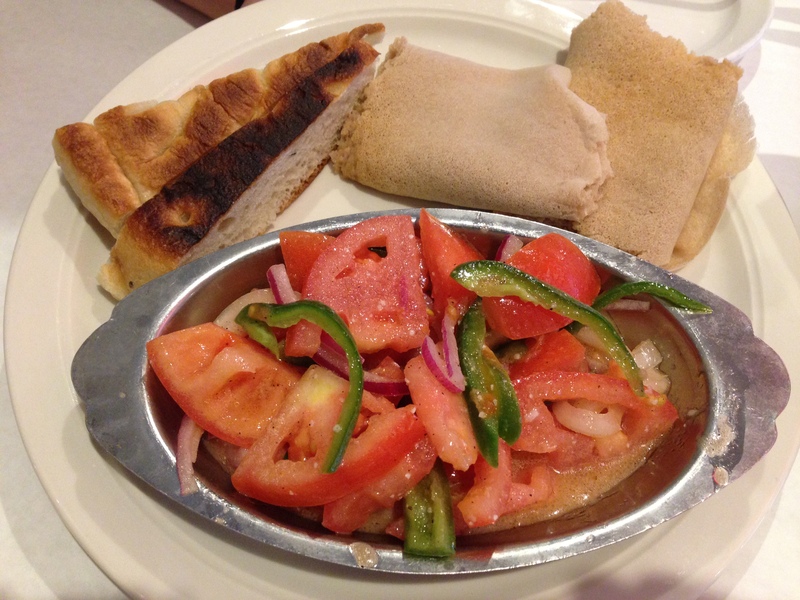 We also got an order of the timatim selata which I likened to an Ethiopian version of pico de gallo. It consisted of tomatoes, onions, and jalapeno pepper slices all coated in a lime vinaigrette. 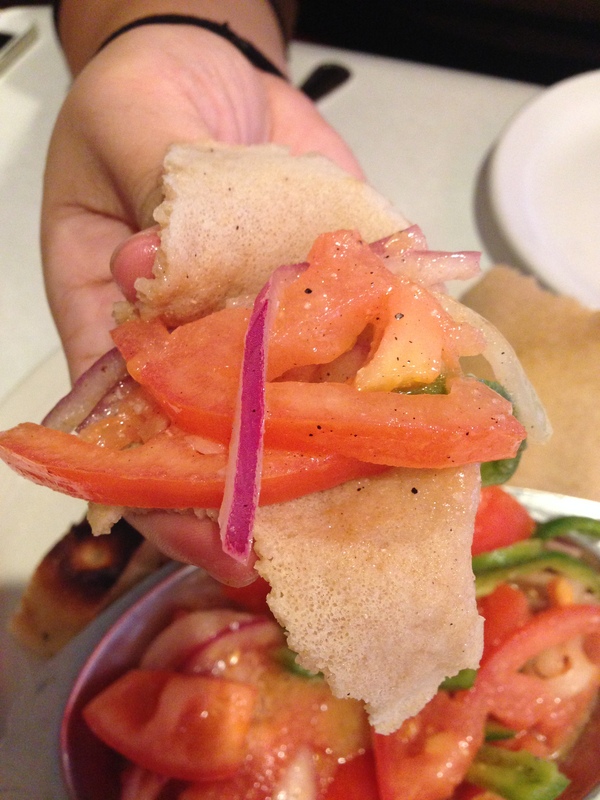 It was tangy and flavorful and was handily consumed (pun intended) with the ubiquitous Ethiopian flatbread known as injera. 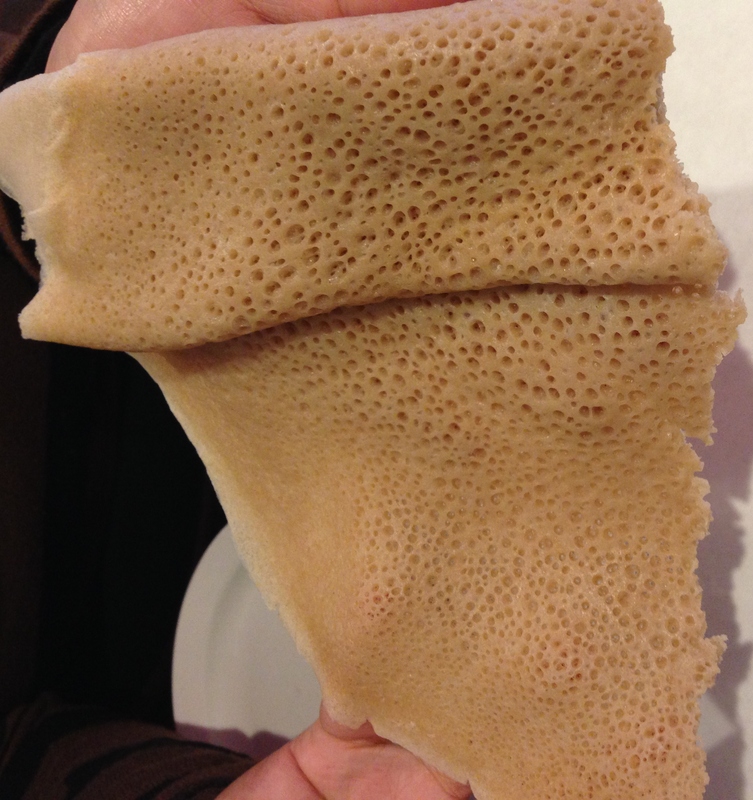 While flatbreads can be found around the world in cultures that eat with their hands like naan in India or pita in Greece, injera is super unique in the sense that it is spongy with a slightly sour taste compared to its more doughy brethren. Thankfully, it had plenty of nooks and crannies to soak up all of the lime juice but was also strong enough to enclose the large slices of tomato. After polishing off that flavorful and refreshing appetizer, we got our main entree. 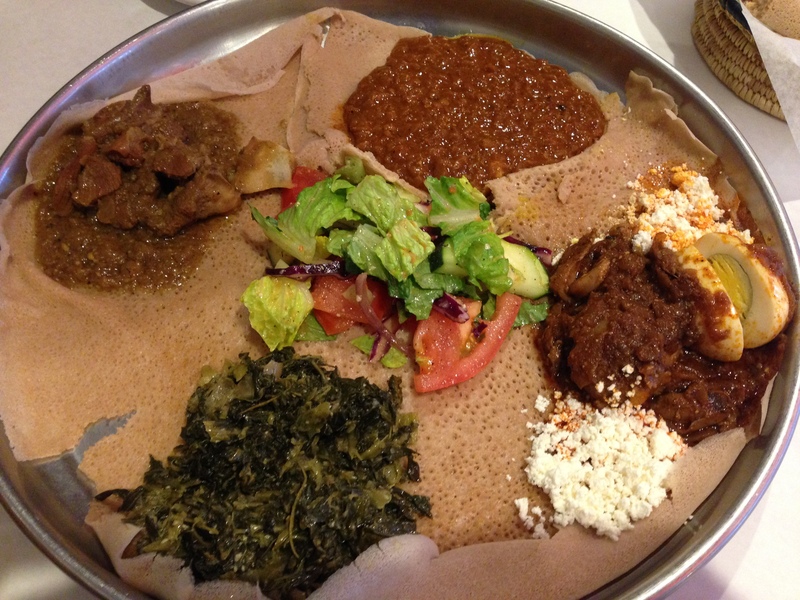 Traditional Ethiopian cuisine focuses on family style dining where everyone eats from the same plate. On our plate, we got the ye-beg alicha (mild lamb cubes), doro wat (chicken in a mild sauce with ayib cheese), ye-misir wot (split red lentils in spicy berbere sauce), and gomen (chopped collard greens). 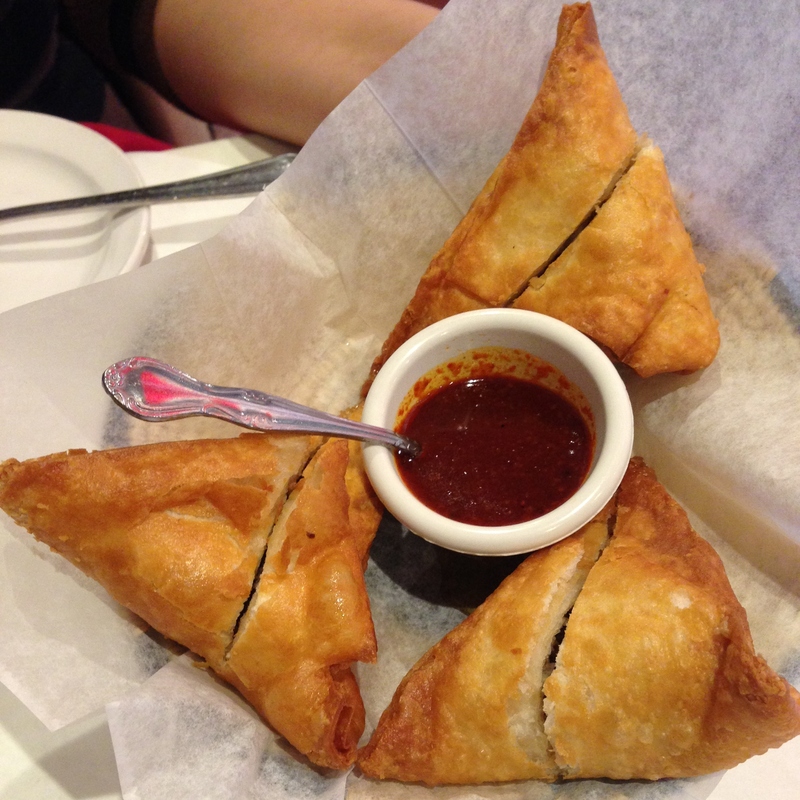 With the spicy lamb, it was a great mix of spice and the slightly gamey taste that comes with lamb. The doro wat chicken wasn’t as bold as the lamb, but the ayib cheese was like an African queso fresco that gave this savory part of the meal a cool and semi-salty twist. I really enjoyed the split red lentils because they were super spicy, but I was mixed on the collard greens. On the one hand, I enjoyed the earthy, spinach tones, but the ginger notes kind of left me cold on this hot entree. Surprisingly, we had a bit of room for dessert, but we could only get the missionary delight, a basic vanilla sundae, because they apparently didn’t have enough ingredients for the dessert we wanted, the sambussa turnovers. 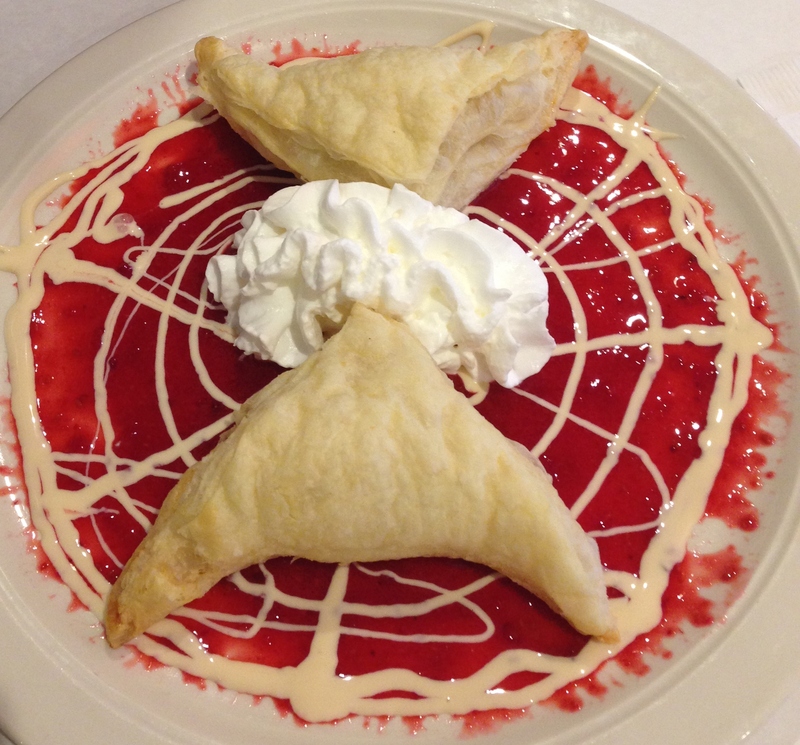 Super normal for a restaurant that serves food that isn’t on many peoples’ radars, but thankfully, our waitress told us that we could get the dessert we originally wanted, the turnovers. What they consisted of were sweet versions of the savory sambussas we had earlier in the meal. It was the same flaky dough, but instead of beef, there was a melange of walnuts, cardamom, walnuts, saffron, and rose water. 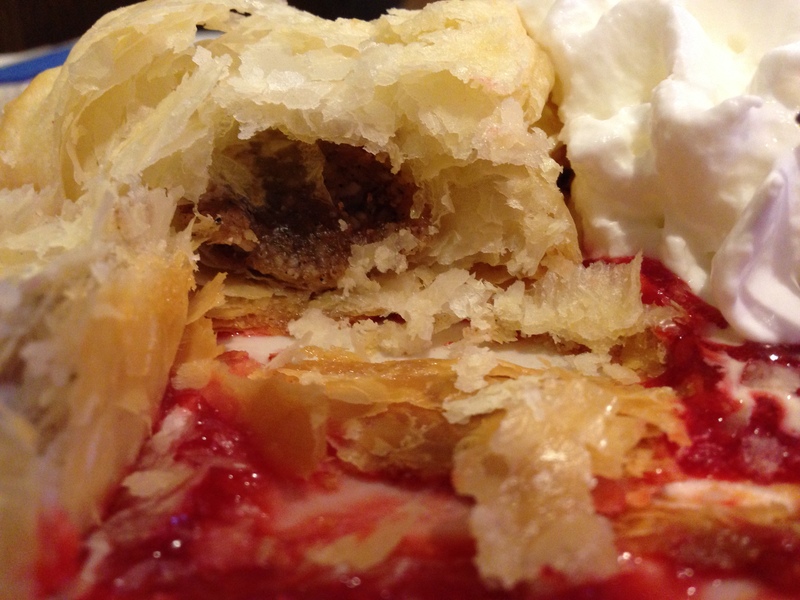 It reminded me of a honey-less baklava with an almost flowery aftertaste compliments of the rosewater. The strawberry sauce was a bit too much of guilding the rose for me which made me prefer the savory version of these handheld treats. At the end of the meal, we were absolutely stuffed but greatly pleased with Demera’s food selection. 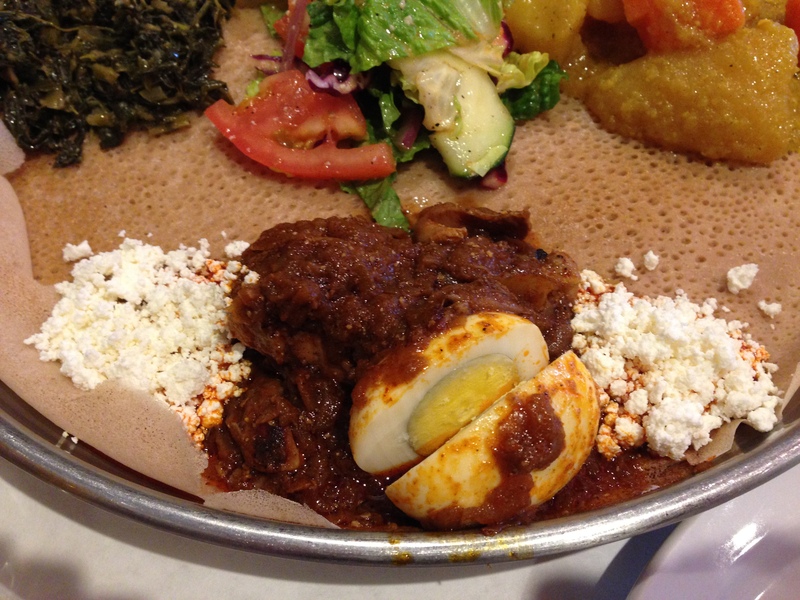 So if you’re tired of the same old restaurants serving foods you’ve heard of before, check out a red-hot slice of Ethiopia at Demera.